This past weekend our hiking group spent two sunny days giving the District of Columbia some loving! Saturday was the early morning visit to the U.S. National Arboretum that I mentioned in my last post, and the sunshine and light breezes made it a much more enjoyable hike than when I visited earlier to scout. Starting at 8:00 am on a Saturday discouraged all but around 20 hikers, but it was well worth the lost sleep, since by the time we finished around 10:30 am, the place had filled up considerably – the northern parking lots were already full, and there was a line of cars still waiting to enter! The hike was pretty much as planned, with one exception: I took the group down the service road off Hickey Hill Road to walk along the Anacostia River, thinking we could then climb up through the Asian Gardens to return to the road. Unfortunately, the gate leading back into the park was locked, and a phone call to the rangers found them unwilling to come unlock it, so we had to retrace our steps before continuing our loop. But as the update to the Google map shows, the only real effect was lengthening our hike to almost 5 miles, which was fine. After the hike a few of us drove to the nearby Atlas District for a late breakfast. 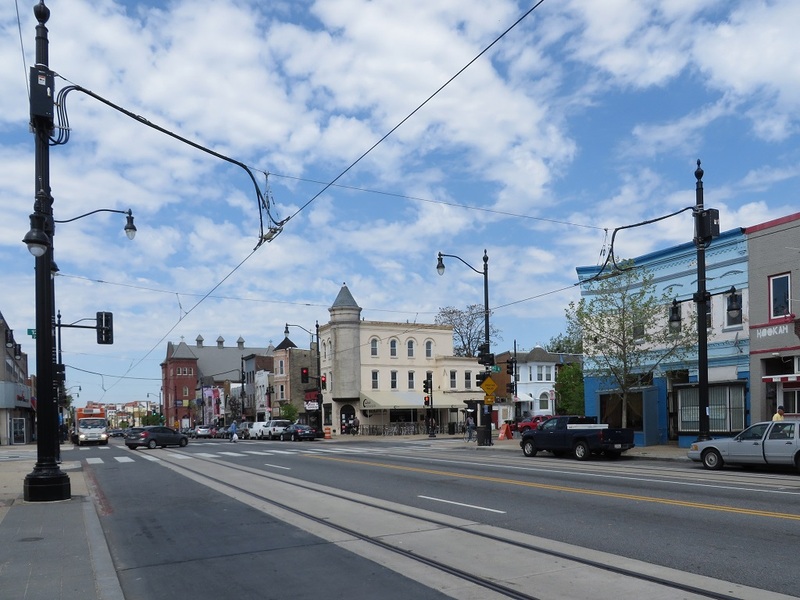 The streetcar wires are up along H Street and the streetcars are supposed to be in operation sometime this summer. The Atlas District has never fully recovered from the devastation of the riots in 1968, and is known today mostly for its nightlife. It remains to be seen if the much-heralded revitalization will finally set a course for the return of commerce to the district. Sunday we did a 5-mile urban hike around the East Capitol district in Washington D.C. I had been planning this hike since the gray, cold days of February, laying out a route leading past many of the landmarks in the district that are on the National Register, so it was gratifying to finally get a warm sunny day. But the best part, as usual, was the fun bunch of folks that came to the hike! A Google map of the route is here, and there is a printable PDF map here that provides both the route and a thumbnail tidbit description of each of the landmarks, adapted from Wikipedia, the National Register of Historic Places, and other sources. Next weekend I was hoping to follow up the East Capitol hike with a repeat of the Fountains and Gardens hike that we have done several times before. It would be a natural fit, since it starts at Union Station just west of where the East Capitol hike left off, and takes you clockwise around the National Mall to see the many fountains and gardens that dot the area. Unfortunately, it looks like rain all week, followed by a cloudy, rainy weekend, so we’ll have to do something else and come back for the Fountains and Gardens Hike when conditions are more favorable for taking photos. This entry was posted in Hiking, Photography and tagged Atlas District, azalea garden, azaleas, District of Columbia, East Capitol, enjoyable hike, H Street, outdoors, U.S. National Arboretum, Washington DC. Bookmark the permalink. Lovely hike especially the garden patch.